On Sunday the IPCC issued its latest report with a new message to the international community and to investors and the business community in particular that reducing emissions to zero is an affordable option and that climate inaction will cost much more. UN Secretary General Ban Ki-moon said that: “Science has spoken” and to pension funds and investors that you should “reduce your investments in the coal and fossil fuel economy and move to renewable energy”. Until recently, the climate debate in America and elsewhere was presented as a choice between the environment and the economy. With the multiplication of extreme weather events resulting from less then 1 degree Celsius of warming and their impacts on lives and the economy, it is becoming clear that this is a false choice. 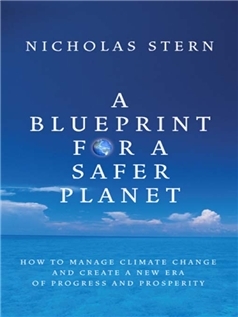 In 2006 already, former World Bank chief economist Nicholas Stern warned that the benefits of strong and early action on climate change greatly outweighed its costs and that the threats to human life – access to water, food, health and the state of the environment – were immense. In 2013, at the World Economic Forum in Davos, Nicholas Stern confessed: “Looking back, I underestimated the risks” but emphasized the economic opportunity of ambitious climate action. Significant reductions in green house gas emissions can be achieved at a profit (! ), helping mitigate climate change while creating jobs and growing the economy. McKinsey conducted one such study of the costs and opportunities of reducing emissions. 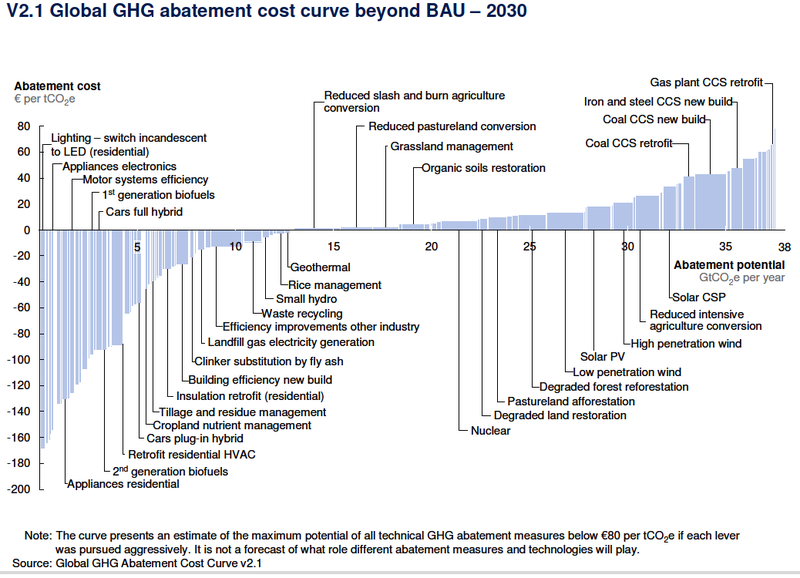 On the vertical axis we see the cost of various measures to reduce Green House Gases (GHG). As we move from left to right we begin with the most interesting ones (lowest cost) and to the right we have the more expensive ones. On the basis of this analysis we should therefore prioritize LED lighting, energy efficiency and some second generation biofuels. Measures such as Carbon Capture and Storage and nuclear are however much less interesting in terms of cost efficient carbon reduction measures. Despite its limitations, the study provides an interesting method of prioritizing climate action measures in ways that realigns the false choice between economy and environment. This iis nicely expressed. !